Updates to Brian A. 's profile since your last visit are highlighted in yellow. But seriously: love all y’all. Hope to see you in 2019 (pretty sure that’s this year). Btw, if Abel, Fontana Harris and Peters don’t attend our 30, I’m ordering a sit in! Brian A. Hazle updated profile. View. Brian A. Hazle has a birthday today. Liz Taylor, Brian Hazle and Stephanie Swintek at grad night. 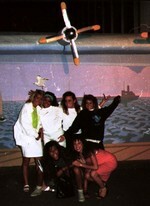 Sarah, Fran, Staci, Cathy, Tiffany and ? (I'm sorry). Grad night. Good luck explaining this one Jimmy Lee.